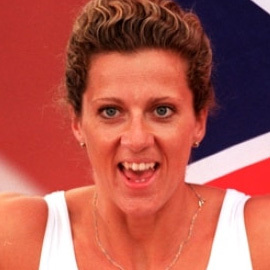 Long jumper, pentathlete, 100m sprinter, 400m specialist – hurdles or on the flat… Sally Gunnell OBE has done the lot. The ultimate athlete and Olympic speaker, she has been Olympic champion, Commonwealth champion five times, Goodwill Games champion, European Cup winner four times, World Cup winner twice, World champion and European champion – indoor and outdoor. In all, Sally has won an incredible – count them – 16 gold medals. On the rare occasions when she came anywhere but in first place, Gunnell also won four silver and four bronze medals. However, of all those achievements, her name will be remembered mostly for the two medals she won at the 1992 Olympic Games in Barcelona. While her bronze medal in the 4 x 400m relay was roundly applauded, it was her gold medal-winning performance in the 400m hurdles that really put her among the greats of British athletics. What struck onlookers most about Sally’s winning performance was how she set off badly but managed – through sheer grit and determination – to get to the front of the pack and be first over the line. The Olympic speaker’s mettle was also visible to all during the World Championships of 1993 when she had planned to pull out of the 400m hurdles due to a cold that had surely influenced her bronze medal performance in the relay. Changing her mind, Sally went on to win the gold medal and break the world record, the time still remaining a British record. To date, the seven-times AAAs 100m hurdles champion is the only woman to have won the Commonwealth, European, World, and Olympic 400m hurdles titles. Since retiring, Gunnell has appeared on TV many times, including spells as a pundit for the BBC and a participant on Total Wipeout, A Question of Sport, Sport Relief, You Bet!, The Cube, The Weakest Link and This Is Your Life. To book Sally Gunnell for your event, contact Champions Olympic Speakers today on +44 1509 85 29 27, or fill out our online booking form.